Champagne Beach. Is this the world’s most beautiful? 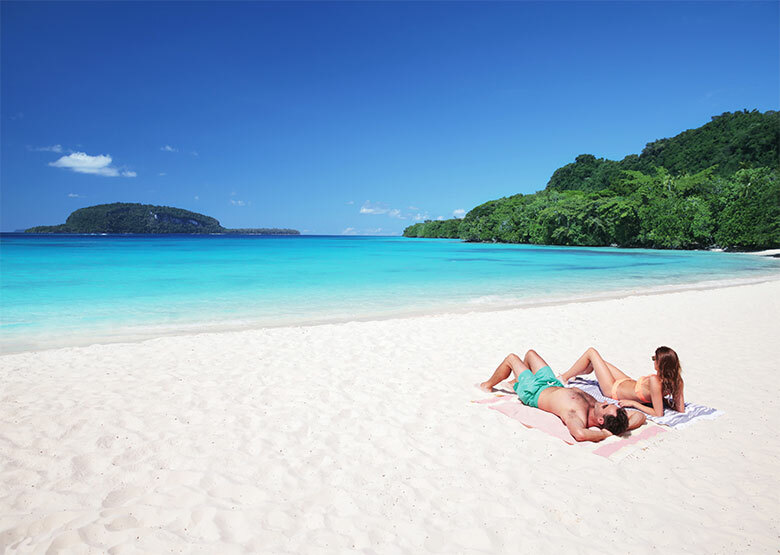 This beach could arguably be the most photographed location in all of Vanuatu. It has appeared in countless travel brochures around the world, been the location of movie & commercial shoots, all of which is understandable. To visit Champagne Beach is to visit one of the world’s great tropical beaches, protected from nearly all weather conditions with almost pure white sand that squeaks beneath the foot, surrounded by jungle. The name “Champagne Beach” comes from effervescent bubbles of volcanic origin occasionally found in the waters of this stunning spot. You will also notice the framework of many stalls set up along the grass; transformed into brightly decorated market stalls on cruise ship day. There’s quite good snorkelling off to the sides of Champagne Beach but even if you’re not that way inclined you can make your way around to the jetty to see the delightful little blue fish swimming all around that area. We recommend Paradise Tours as a reliable tour operator in Santo. The Millennium Cave tour is an action-packed, adventure-filled experience. Not for the faint-hearted but if you enjoy a challenge join the trek through the tropical jungle, explore Vanuatu’s largest cave, scramble over rocks and boulders, then cool down with a river swim. Inside the Cave, follow your Guide as you navigate the river bed, examine the walls of the Cave and aim your torch up to the Cave roof, where high up is the home of tiny bats and swallows. Once through the Cave, the river adventure begins ….. the boulders are enormous; you climb under and clamber over, testing your fitness and sense of adventure. Along the river swim soak up the breathtaking scenery with cascading falls and towering rock faces, take the time to shower under the waterfall or jump into the river from surrounding rocks. Millennium Cave is situated in South Central Santo, a 45-minute drive from Luganville town. When the transport stops, a 15-minute walk then takes guests through coconut plantation and across a bamboo bridge leading to the village of Funaspef. You are provided with a torch, life jacket and flotation aid for the walk through the cave and the river swim. 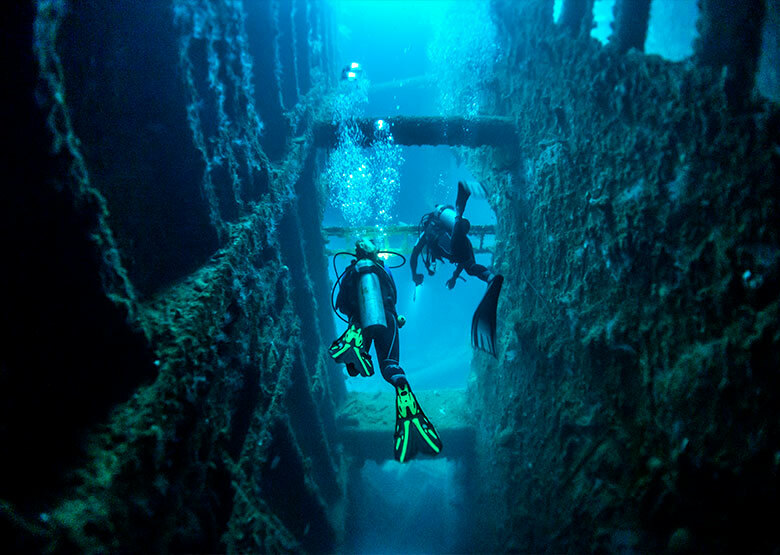 The sunken luxury liner ‘SS President Coolidge’ is a draw card for divers all year round. The impressive wreck (198 metres long) is one of the largest accessible wrecks to sport divers anywhere in the world. The SS President Coolidge was a luxury passenger liner converted to a troop carrier during WWII. While entering the Santo harbour she hit two friendly mines, providing divers with a remarkable underwater playground. Matevulu, is the largest of Santo blue holes and is only a short 45 minute paddle away, starting directly opposite Oyster Island Resort. Paddling up the crystal river to reach the swimming lagoon is an experience in itself – like being lost in the Amazon! It takes about 30 minutes to paddle up the river (you can also drive direct to the blue hole – just follow the signs from the highway). Once at the blue hole you are rewarded at the end with a great swimming area and a giant rope swing tied onto a large banyan tree. There are also toilets there. 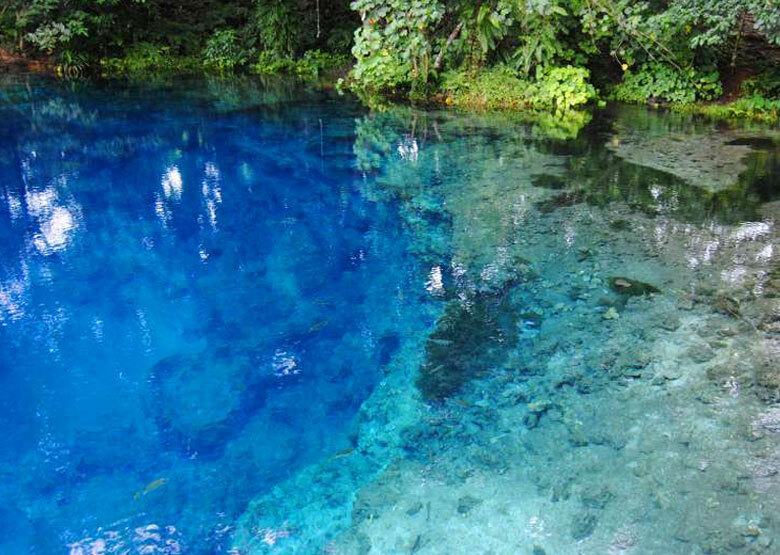 Ri Ri, is by far the prettiest blue hole/crystal river out of all the Santo blue holes. It is another 45 minute paddle farther south of Matevulu Blue Hole. Paddling up the entrance lagoon and crystal river is nothing short of magical! You can also visit both these blue holes by car as well, and at Ri Ri Blue hole you can choose to have locals paddle you up via outrigger canoe (ask the locals near the bridge going over the Ri Ri river). The locals have gone to a lot of effort to provide platforms, bathrooms and change areas to make this blue hole easily accessible. You don’t always expect Santo to have 5 star cuisine or quick service, but we always experience both at The Tu. Pleasantly surprised by the atmosphere (with a super interesting ww2 memorial for the history buffs) and how cheap the food was on our first visit, this is now one of our ‘go to’ restaurants whenever we visit Santo. A great selection of meat dishes with our favourite being the spare ribs. HUGE! If you’re hungry and in need of quality food that won’t cost you your plane ticket home then The Tu should be in your Santo dining plans. Access to free wi-fi is a welcome bonus when needing to catch up on emails and messages after a day out exploring. 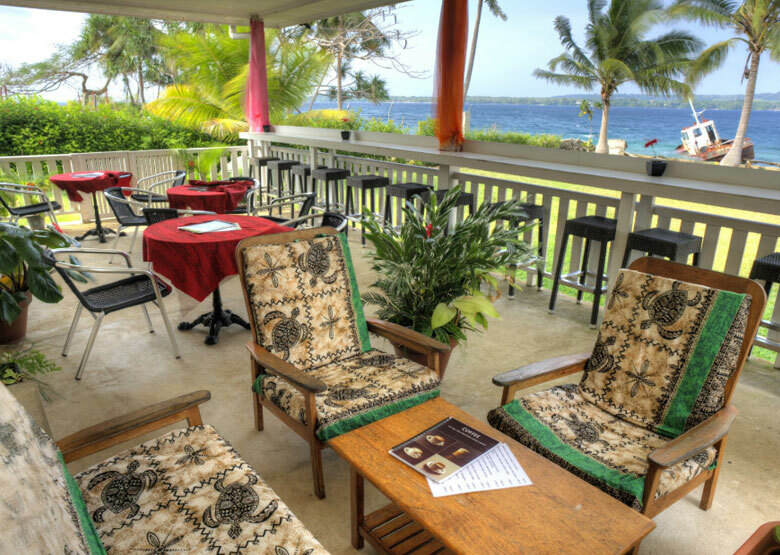 Its located at The Espiritu Hotel on the main road in Luganville. 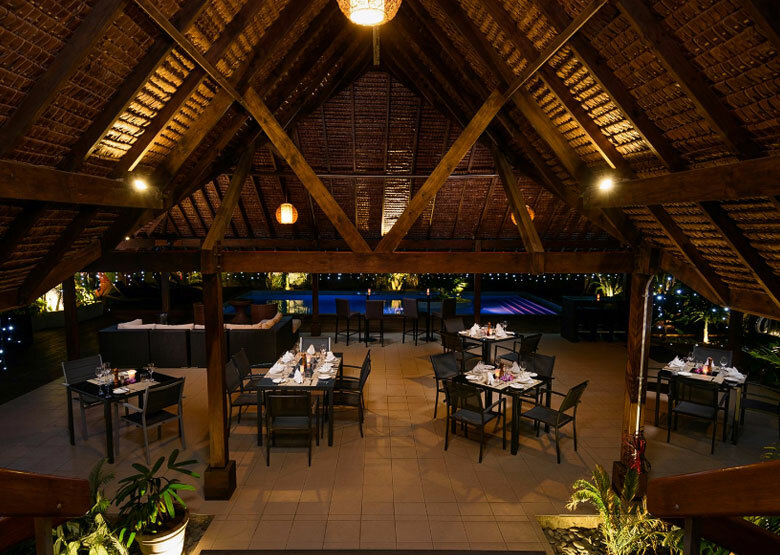 Consistently voted by travellers as the best restaurant in Santo, 1606 serves local organic food with a relaxed island vibe. 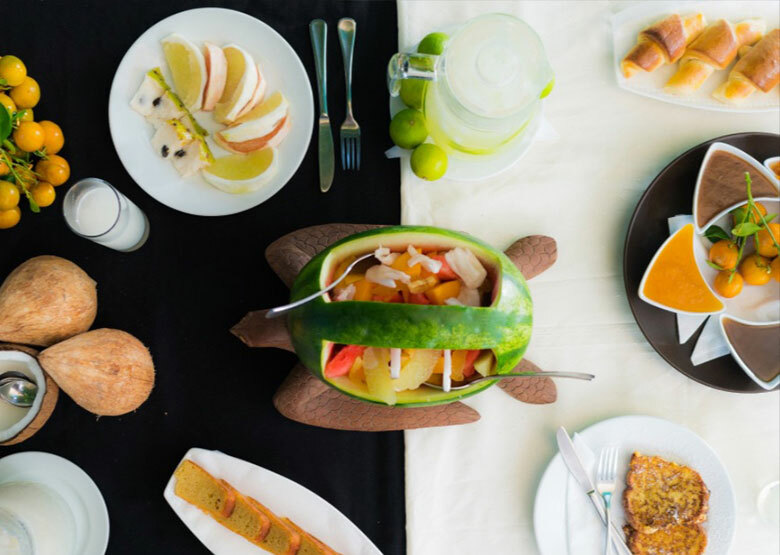 The restaurant offers local organic produce (market fresh) as well as Santo beef and Poulet Fish. “Reef and Beef” dish is always a favourite. Yummy, well-priced food. Big servings. Friendly service. The restaurant’s signature homemade sorbets are a delight on those warm afternoons. The charm & excitement of Santo is the remote natural wilderness of the island, but you don’t have to miss out on city cafe comforts. This little cafe bats way above its weight, with great coffee, tea and pastries usually only found in a big city. Get the best from homemade falafel wraps to Nutella and banana crêpes, freshly fished tuna, homemade quiches, fruits salads, granite, delicious sorbets, Croque Madame, milkshakes.